Francesca Gelai reaches into her backpack and pulls out a metal tin. Rattling around inside are a collection of hand-painted artificial eyes. But when she peels off the lid and spills the contents onto the table, they’re not the spherical, marble shape most people would expect. The curved front of the eyeball gives way to a variety of shapes, almost as though a sphere has been sliced in half and then flattened on one side by a thumb. “They’re like little almonds or lozenges,” Ms Gelai said. Ms Gelai, 27, and her friend Nelly James, 31, met while working in a Melbourne optometry practice. 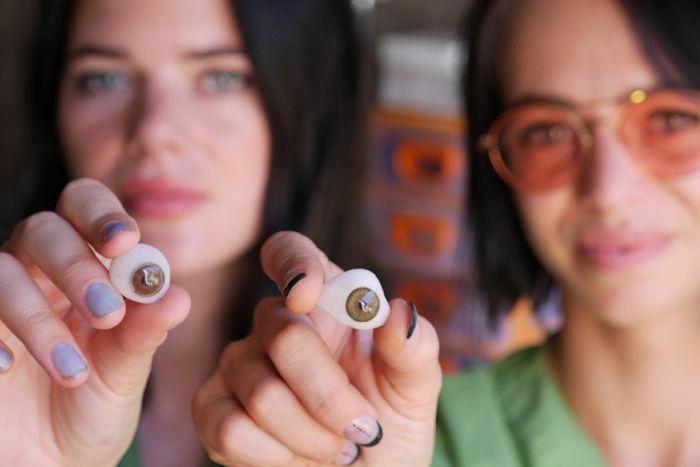 But six years later, after self-funding their training, they are now among the handful of Australians working in the niche art of ocular prosthetics. “It’s somewhere between arts, science and medical,” Ms Gelai said. 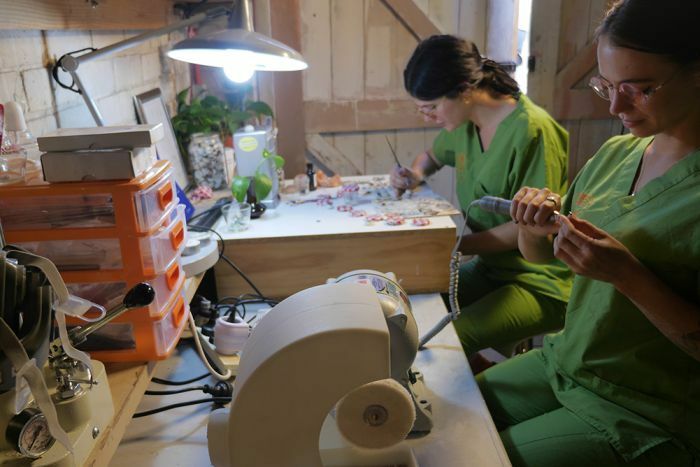 Now, the two opticians make eyes out of a garage workshop in Melbourne’s eastern suburbs. 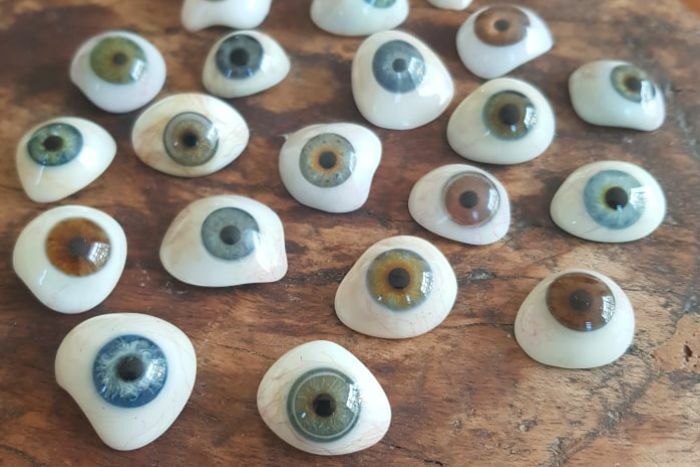 The incredibly realistic artificial eyes are made in a painstaking and precise process. It takes around two or three days to make each one which last around five years. “There are 40 steps involved … you have to master each of the 40 steps; the waxwork, even the painting,” Ms Gelai said. Add a second layer of clear acrylic to make the eye shine and ensure the iris appears three-dimensional. Precision is essential throughout the process, Ms Gelai said. 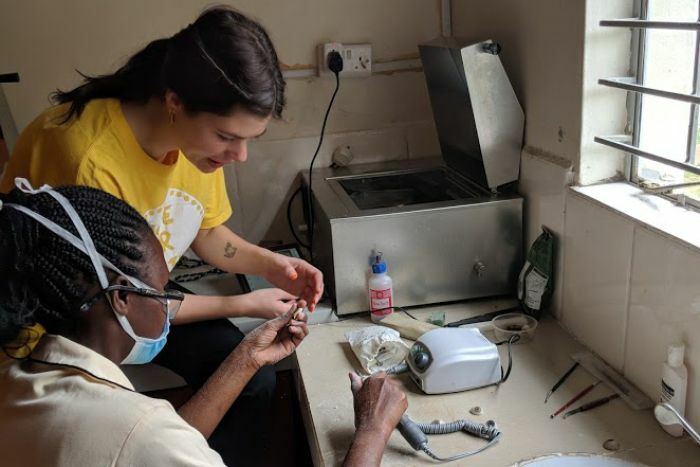 If an artificial eye is not fitted properly, it can cause infection or painful growths in the eye socket — it’s something Ms Gelai and Ms James witnessed on recent trips to Africa. During their visit they made prosthetics and trained others in the art of ocularistry, meeting patients whose eye sockets had been damaged by ill-fitted stock eyes. “It was meant to be work experience, but when we were there we just noticed how much the profession is needed there,” Ms Gelai said. Many of the patients who had lost their eyes due to disease or trauma had experienced social exclusion due to stigma and superstition surrounding people with a disability. “People would live in more extreme poverty because they are ostracised from the community,” she said. The pair estimate they have spent more than $50,000 on training and volunteer trips over the past four years. They’ve started a crowdfunding page which they say will be spent on setting up a clinic in Nairobi, Kenya and furthering their training. “We’d do these trips and we’d come back and save, save, save, work, work, work, and we’ve just realised that we could do so much more with a bit more support,” Ms Gelai said. Ms James said while the eyes could not restore someone’s sight, they did give people a sense of confidence that could change their life. One mother whose child was born with under-formed eyes had not taken her child out of the house for four years because she was worried about what her community would think. She did not know that a prosthetic eye was even an option for her child. Another of their patients has started doing modelling. “It’s so special to be a part of somebody’s rehabilitation with something like that,” Ms James said.